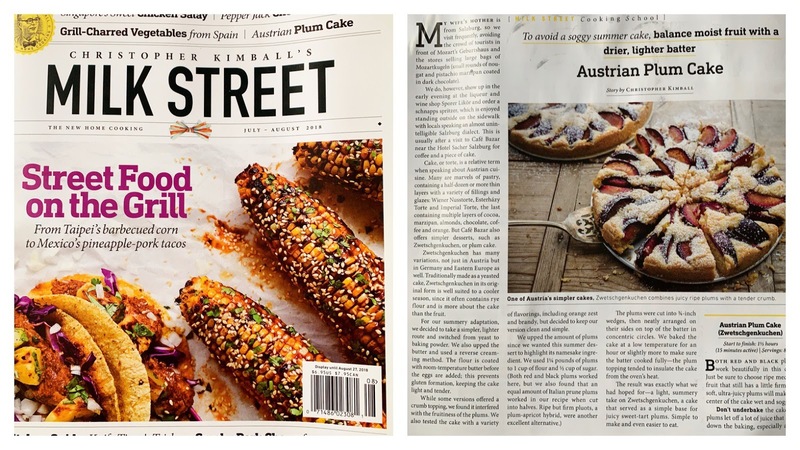 This cake is a lighter version of the yeast leavened and somewhat heavier Austrian cake enjoyed at the Cafe Bazar in Salzburg by writer and founder of Milk Street Magazine, Christopher Kimball. 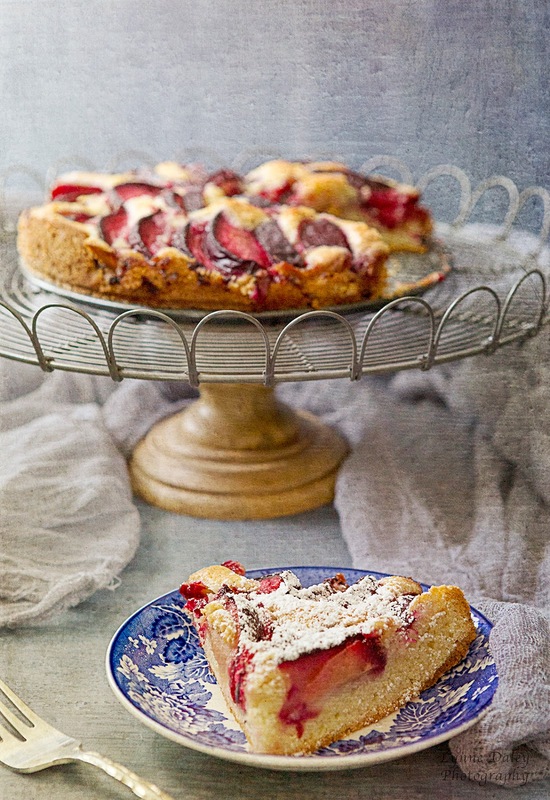 Kimball wanted more of a summer dessert so his recipe developer, Erica Bruce, switched out the yeast for baking powder, increased the butter and the amount of plums and came up with a lovely cake that showcased the beautiful plums. Also, using a reverse creaming technique in which the flour is coated with room temperature butter before adding the eggs helps the the cake lighter. 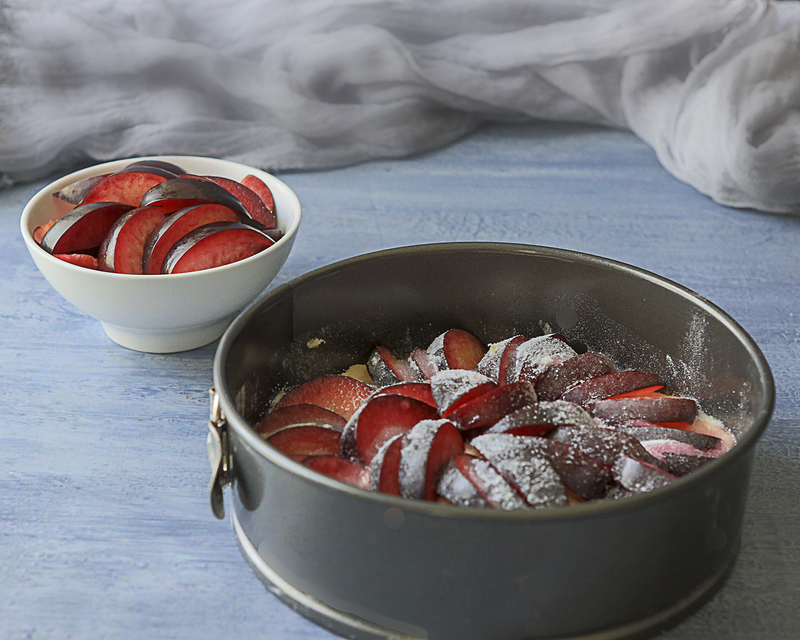 I have made this Austrian Plum Cake twice and know this recipes give great results. Ripe firm plums that hold their shape work best in the recipe. Soft plums like the Santa Rosa variety would not be suitable as the juiciness of these types of plums will make the cake too soggy. Red plums are used here, but black plums, pluots and Italian prune plums would work as well. For a double plum hit, try my Wild Plum Ice Cream! 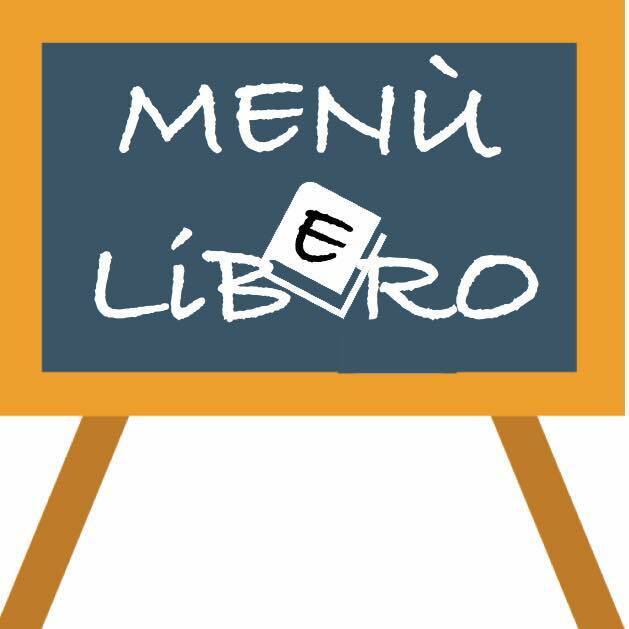 Today, I am chef for Menu Lib (e) ro! I am looking forward to seeing your lovely cakes and semi-frozen desserts. When published, please add a comments on this blog post by December 20, 2018. All the recipes will be collected in http://abcincucina.blogspot.comand a pdf will be prepared step by step and it will be available at the end of the project. Preheat oven to 325° F (165°C). Spray lightly with cooking spray a 9-inch springform pan, then dust with flour, tapping out the excess. In a stand mixer with the paddle attachment, mix together until combined the flour, 1/2 cup sugar, baking powder and salt. With the mixer running, add the room temperature butter 1 piece at a time. After adding all the butter, continue mixing just until mixture resembles wet sand-about 2-3 minutes. Add the egg, egg yolk and vanilla extract. Increase the speed to medium high and beat until the mixture is pale and fluffy, about 1 minute, scraping down bowl as needed. Transfer the batter to the prepared springform pan and spread in an even layer. Batter is thick and I found that using a wet spatula helps smooth the batter equally. Arrange the plum wedges in 2 concentric circles, placing pieces on their cut sides. Sprinkle with the remaining 2 tablespoons sugar. Bake until golden brown and a skewer inserted in the center comes out clean, 1- 1-1/4 hours. Make sure there are no moist crumbs adhering to the skewer. 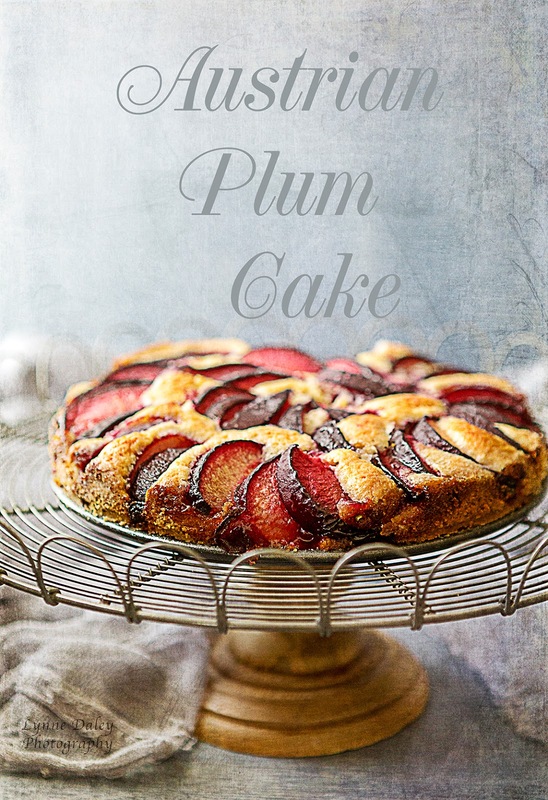 Don’t under bake the cake as the plums give off juice and will make the cake soggy. Serve warm or at room temperature, dusted with powdered sugar.